Do you have a golden voice, or would you like to gild it? 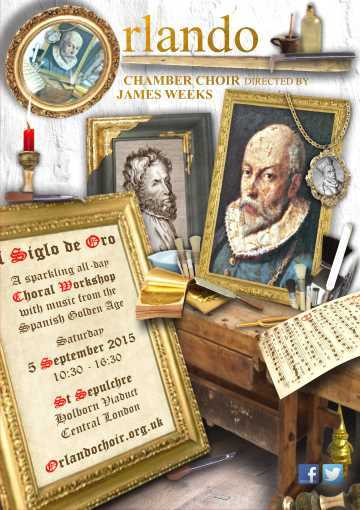 Then join Orlando Chamber Choir for its summer workshop, directed by James Weeks. We will rehearse and polish aurous compositions from the Spanish Golden Age including resplendent large-scale works by Tomás Luis de Victoria, Francisco Guerrero and Cristóbal de Morales. You'll need shades just to read the music! The intervals will be enriched with a selection of homemade Orlandian cakes which are gold-standard too. Depending on the forces available we'll work on some or all of the works listed below.